Fibre has recently become a much-used buzzword, referring to super fast internet connectivity. Many companies are offering deals of 10Mbps or even 20Mbps Fibre. 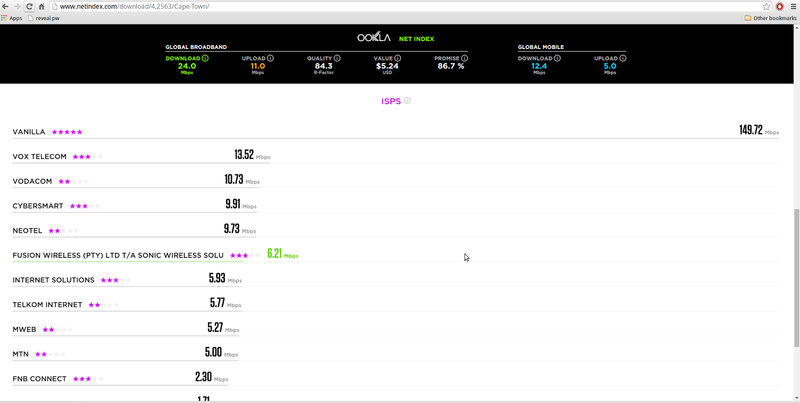 Compared to Telkom's 2Mbps ADSL lines, this might seem really fast. Yet, this is not even half of what fibre should be giving you. A fibre line should give 100-1000Mbps of data transfer, and if you are getting less that that it means the ISP is constraining the bandwidth - in essence, limiting the fibre's capacity. With an option of 1000Mbps, the promises of "lighting fast" connectivity with 10Mbps seem a bit of a stretch. Vanilla is a very small ISP (Internet Service Provider) and as such we are able to keep our network the fastest, cleanest network in all of Africa (independently measured by speediest collator, Ookla). We recently reached an average upload/download speed of over 100Mbps across all our servers - this effectively means each of our customers are getting the real speeds of fibre. We joke about this analogy, but when it comes to service, we really are the Ferrari of fast Internet. We want to provide this to users, but being on a fast network means you have to be conscious and discerning. I have to start this by admitting that I have never thought of myself as a "technology" person. Indeed, my technological skills could be likened to those of a newborn two-toed sloth. Now, however, I am slowly developing some dexterity in my two toes. This education began with my first day at Vanilla, where I learnt that "fibre" refers to the use of fibre optic cables, made from glass fibres as thin as a strand of hair. Previously, Internet was transmitted via copper cables or radio waves. The mode of transmission, however, is really not important: the speed is. This means that consciousness while using is tantamount. This is not a Citi Golf, it's a Ferrari. Not that there's anything wrong with Citi Golfs (I used to have one), but if you’re driving a car as powerful as a Ferrari, you have to be responsible. Having a super fast network will mean that people target your network in order to exploit its booty - don't let them take your car for a joyride. Vanilla can only be the fastest and most economical by metering your usage which is the most valuable tool for ensuring the "cleanness" of a network. Then we have the capped versus uncapped debate. Most people instinctively think uncapped will be better, because more is more right? Maybe not. 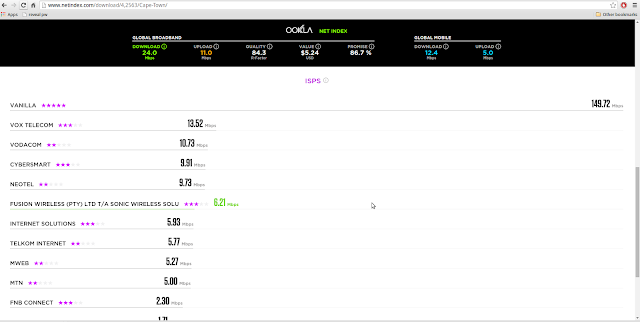 If you can only download at a speed of 3Mbps second, you won't be getting much out of that "uncapped" service. In fact, for a while Vanilla had a Hall of Fame for the highest downloaders in a month, with basic uncapped accounts. They were all awarded a large tub of vanilla frozen yoghurt, because it takes a lot of determination to squeeze out every drop you can from a slow connection. If, however, you have 100Mbps, it will be like turning on a tap and having water gush out, continually. We can give you the cleanest, widest pipe, but we can’t give you free water, so you have to be aware of how much you use. We have many services that help you monitor this, and you will also become a much more conscious internet user. So, who wants a Ferrari?